Well, it’s about that time of year again for us to consider whether or not we want to go thru the process of getting nominated and then voted into the Hartford Advocate Grand Band Slam 2007. Last year was a bit disappointing, mainly because the event was at least 1/2 the size it was in 2005, so they had a fraction of the bands and, of course, we didn’t make the cut. Yeah, there’s a bit of sour grapes there – because we really did get the word out and had TONS of people 1) nominate us and 2) vote for us. The previous year, I orchestrated the Grand Band Slam voting for my buddy’s band Wicked Garden. With a fraction of the number we had with Chum, they got in no problem and played the ’05 Grand Band Slam at Up Or On The Rocks. Nominations end on 5/10/07. Official voting for this year’s festival runs 5/23/07 through 6/11/07. If you help us get nominated, we’re going to bring a laptop with internet access to our gig at Sweet Jane’s on 5/25 as well as the private party on 5/27, so you can come party with the band and shoot us a vote all in one fell swoop!!! 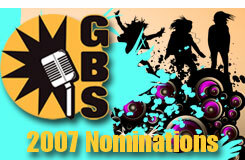 The link to the nomination page is here: Grand Band Slam 2007 Nomination Page – pretty simple to do.. just enter your name and email address and click submit. On the next page, select the dropdown for Category and select “new group”, then in “band” type Chum and the Oily Fish Bits. I’m pretty sure you can leave the rest blank, but if you want to leave a glowing comment for the judges to chew on that would be great :). Then all you gotta do is click “submit nomination”. 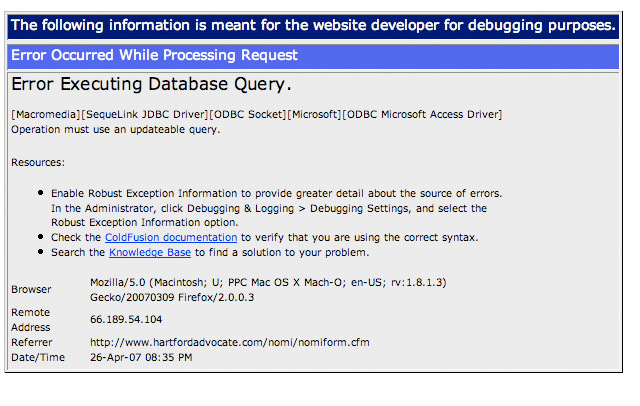 Hopefully, you will not get this error and it’ll be smooth like ‘butta. If not, be so kind as to give it another try in about an hour – everything gets fixed in about an hour :). This is just the NOMINATIONS mind you – IF we get nominated, we’ll have to go thru this again to actually get voted for and into the Slam. Put on your boots this is gonna be a hot one!